Scafell Pike is the highest mountain in England and a big magnet for walkers, but lives are being lost because too many are unprepared. Mountain Rescue teams are now repeating warnings for hikers to take care. At more than 600m (2,000ft) above sea level, Mountain Rescue team member Richard Warren points out a junction on the path down from the summit of Scafell Pike. He agrees that if the fork was a road junction, it would have signs and bright paint all over it warning of the dangers. "We have so many problems here", Mr Warren said, adding: "Particularly in bad weather. "They want to go left down into Wasdale but they look at the junction, they're not sure and they go right". After going right, many walkers realise their mistake and backtrack, but others strike off along a less well-defined path they believe is an alternative route, and get into serious trouble. The area known as Piers Gill has vertical drops into a stream far below. Mr Warren says last time he talked about retrieving the body of a 19-year-old from here, he broke down in tears. 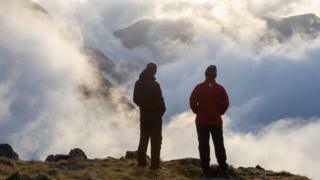 "Thousands of people come up here to climb England's highest mountain," he says. "But too many of them are ill-prepared, they get lost, they get into difficulty." He looks down sadly into the gully. "Too many rescues, too many fatalities, too many tragedies. We just have to do something." That something, rescuers suggest, is a signpost at the junction where people make that wrong turn. But putting signs on the high fells of Lakeland is very contentious. You will find public footpath signs aplenty in the valleys and car parks but not at altitude. Much of the Lake District National Park was gifted decades ago to the National Trust. They manage this beautiful landscape that is now a Unesco World Heritage Site. "Many people are passionately against signs in the Lake District on the high fells," says Sam Stalker, the senior ranger responsible for Scafell Pike, which stands at 978m (3,209ft). "To do that on Scafell Pike would have ramifications across the whole park. It is something that will have to be very carefully considered." So no early sign of a sign yet, then. What the rescuers are desperate to cut down on is what they define as "unnecessary call outs". These are often caused by people navigating using the map and compass built into their phones. "We have so many avoidable rescues," Mr Warren says. "People haven't prepared, they haven't got the right kit. If they'd thought just a little bit they would have prevented the team having to deal with the incident." It takes its toll on rescuers too. Funded by donations, the teams are made up of unpaid volunteers - people who love the hills and are motivated to help others. But it takes 16 of them to carry a stretcher down a mountain. With an average of 40 members in a team, people can soon get worn out. It can cause problems at home too. "Team members often feel guilty if they are leaving their families again, but equally guilty if they don't come, because they think they are letting the team down," Mr Warren says. In his home in south Wales, David Jones reflects that he was one of those who created an unnecessary call out. An experienced walker, he set off up Scafell Pike last year with his daughter and her partner. They knew bad weather was due, but were confident they could get up and back before it closed in. They reached the highest point in England but loitered at the top for too long. By the time they came to descend, visibility was poor. "This mountain isn't like many others, it's quite dangerous," says Mr Jones. "We had mobile phones with maps, but of course it uses mobile signal to communicate and that doesn't work very well when you're in a storm on a mountain." After struggling to find the right route, they dialled 999 and were put through to Mountain Rescue. The teams have the technology to send a text message to pinpoint your mobile phone. This accurate positioning, similar to a "find my phone" app, can allow lost walkers to be guided down without a team having to leave base. But Mr Jones found it was not quite that simple. "Whilst we thought we were going in the right direction, Mountain Rescue were telling me we were going the wrong way," he says. "And they said 'you're not using proper compasses, you're using the one on your mobile phone. Don't rely on them, they don't work properly'." The Wasdale Mountain Rescue team then had to deploy to find Mr Jones. "We called them out, when in theory we really shouldn't have," he said. When he later worked out that the team had given 35 man hours to find him, he made a donation of £350 to say thank you. Across Cumbria, the Mountain Rescue teams say they had 186 avoidable call outs last year. They want people to enjoy the hills of the north, but they also want to stop walkers relying on their phones to navigate and learn how to use a map and compass. See more on this story on BBC Inside Out in the North East and North West at 19:30 on Monday 4 March on BBC One or catch up on the iPlayer.